Four University of Pretoria scientists conducting research in sub-Saharan Africa are among a group of 14 women who were recently awarded fellowships by the L'Oréal-UNESCO For Women in Science Regional Programme. Each of the fellows received a research grant at a recent ceremony attended by representatives of public authorities and UNESCO, scientists, academics, intellectuals, thought leaders and organisations promoting gender equality. The group gathered in Nairobi last week to benefit from a training programme that will help strengthen their careers. This three-day training course provided by international experts selected by the L'Oréal Foundation addressed the topics of leadership development, management, negotiation, communication and public speaking, as well as modules such as media training and personal digital branding. The fellows will benefit from a major communications campaign on the African continent, designed to promote and publicise their brilliance. This initiative serves one goal: to highlight scientific excellence of female researchers in sub-Saharan Africa, in order to create role models, encourage other young women to become scientists, and empower women to shape the future of the continent. The L’Oreal-UNESCO For Women in Science Sub-Saharan Africa regional programme has grown significantly since its inception. “After eight editions in South Africa, we decided to host our ceremony in Nairobi to reinforce our commitment to giving all sb-Saharan African women scientists an opportunity,” Palt said. 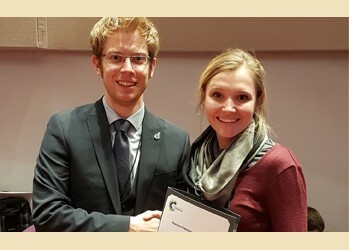 Nicole Neyt, a PhD student in the Riley Research Group, housed in the Department of Chemistry at the University of Pretoria (UP), recently won the first prize in the Royal Society of Chemistry (RSC)’s Twitter poster conference, in the category of engineering, for her work in flow chemistry. This was the world’s biggest poster conference with over 1 900 posters displayed and comes after she published her work on the development of a hybrid batch-flow process route to the anti-psychotic drug clozapine, used for the treatment of schizophrenia and Parkinson’s disease. Ms Neyt works at the interface of chemistry and engineering, looking at the development of new flow reactor technologies and the implementation of it in the total synthesis of active pharmaceutical ingredients. Her work on the clozapine process involved the development of a route that encompasses the use of the best of both traditional batch and new flow technologies, and the integration of these approaches. She was able to demonstrate a complete integrated synthesis of clozapine, improving the current batch process yield from 27% to 45%, while reducing the production time from 132 hours to 44 hours. Remarkably, the synthetic route, which comprises four different reactions, was conducted as a single continuous process with all reactions, downstream processing and purification performed in-line. Ms Neyt was selected for the cover of the February 2018 issue of the Royal Society of Chemistries (RSC) publication Reaction Chemistry and Engineering (React. Chem. Eng., 2018, 3, 17-24). She was awarded second prize for a talk she gave at the 2017 South African Chemical Institute Young Chemists Symposium; as well as second prize for a poster presentation at the Flow Chemistry Europe 2018 Conference, in Cambridge, UK. Synthetic organic chemistry is undergoing an evolution from batch-based syntheses to continuous flow-based syntheses, wherein chemical transformations are conducted in continual flowing streams in tubular and micro-reactors, using state-of-the-art flow reactor technology. The disruptive nature of flow technologies affords improved productivities, continuous production, increased safety and greener processes, and is set to change the face of pharmaceutical manufacturing. Locally, the Riley Research Group is exploring the use of flow technology as a tool to feed into and afford a competitive advantage in an emerging local pharmaceutical manufacturing industry. The group has to date developed flow-based process routes to several key active pharmaceutical ingredients, in collaboration with industry partner Pelchem, with the ultimate goal of commercialising these routes to allow local economic and competitive manufacturing.